We bring nature into our school through targeted showcase displays. 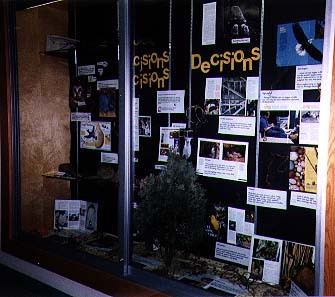 On a regular basis the showcase focuses on a specific habitat topic. One display was called Decisions. It focused on bird nests and nesting behavior. There were lots of fun facts. Did you know that bald eagles in Florida hold the record for the world's largest nest? Some bird's nest in colonies like purple martins. Wrens build several different nest in a summer, but use only one. You can see photos of many different nests like a Baltimore Oriole's hanging nest and loon sitting on a wet, muddy nest. There are a wide variety of nesting materials and actual nests shown. One nest on display had string, hair, yarn, and even a rubber band woven in it. Develop a showcase display or web page/site focused on a topic related to fields, meadows and fencerows. You can select a topic like birds, mammals or wildflowers. Or you could focus on the concept of food webs or predator - prey. You might be interested in honing in on a ecological dilemma related to fields and meadows. Include photographs you have taken and copies of photos from magazines or books. Add natural materials: like dried leaves or an animal pelt. The nesting display included a bluebird nesting box with an old nest in it. The side of the nesting box was left open. A handfuls of dried grasses, small twigs, a pile of small pebbles, pieces of yard/string, a dish of mud, dandelion down, and white pine needles covered the bottom of the display space. A handout could challenge viewers to decide - which bird would use which material? Connect the display through short paragraph explanations and labeling. Demonstrate your word processing skills by generating them in a computer. Tip: local museums are a great resource.They may be willing to loan natural materials for use in a locked display case. Use your paper mache, woodworking, or modeling clay skills to make a 3D element. You could paint or draw some illustrations. Timing is important. Abandoned nests are readily found during winter. Nests should not be disturbed in the spring. Proof your project before posting it. It is funny how speling errors and typeos sneak in to the bets work. 2000 Cynthia J. O'Hora This project may be freely use in a nonprofit setting.